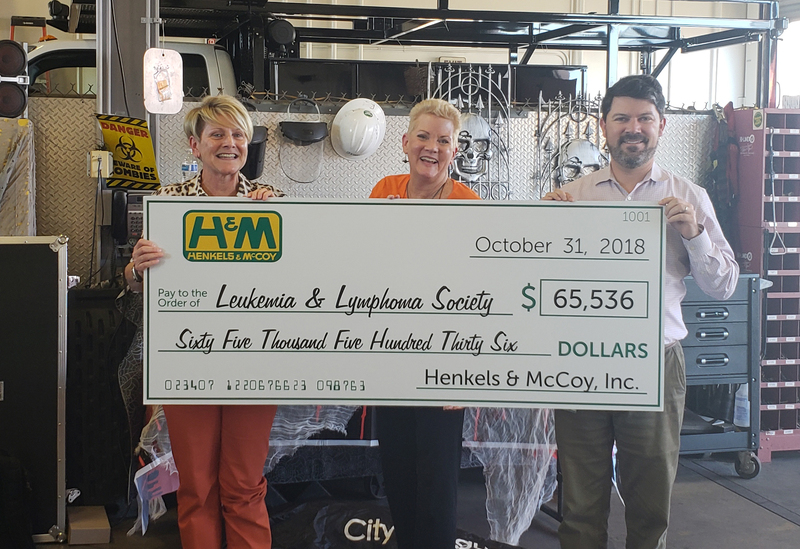 Henkels & McCoy's (H&M) 13th Annual Golf Charity Tournament recently took place in the company's West Region at the Coyote Hills Golf Course in Fullerton, CA raising $65,536 for the Leukemia & Lymphoma Society (LLS). On October 31, 2018, H&M presented the donation to Maria Dunleavy, Leukemia and Lymphoma Society Campaign Manager. "We’re inspired by our team’s efforts in coordinating this incredibly successful tournament. We’re grateful for the support we received from our generous business partners, employees, and participants. Most importantly, we’re thrilled to present such a significant contribution to the Leukemia & Lymphoma Society,” stated Peter Moriarty, Senior Director of Operations for H&M’s West Region. The LLS is the largest nonprofit dedicated to creating a world without blood cancers. The society’s mission is to help find a cure for leukemia, lymphoma, Hodgkin’s disease and myeloma while helping to improve the quality of life of patients and families. For more information about LLS, visit www.lls.org/.